We think that dollars are a good measure of value because we interact with them all the time and we see that they get relative relationships right. A house is worth more than a car is worth more than an iPod is worth more than a steak, and a Ferrari is worth more than a BMW is worth more than a Kia. But we also know that dollar value is not always a good measure of what something is worth to us: I would rather have my Toyota Yaris than a Ferrari, so (if we ignore the potential for resale) the value of a shiny new Ferrari to me might be about $2000 – the price I’d be willing to pay for it. Here in Quebec, I could buy one new from $180,000. This represents a lot variance is the value of a given item across individuals. Nonetheless, the price of a Ferrari may still be a good average estimate of the value across individuals, once the costs of design, production, and so forth have been incorporated (and thus once all buyers like me, who would not be willing to pay the production costs, are excluded). So different individuals value different items differently. No earth-shattering news there. We’re not really as interested in the price of specific items as in the value of a hypothetical dollar. Is this value always the same? Maybe I don’t want a Ferrari because I don’t like fast cars, but if I had $180,000 to spare I would get just as much value out of it by buying luxury foods (or donating it to my favorite charity) as the car enthusiast would get out of buying the Ferrari. Possibly, but I don’t think so. Some people just like being rich more than others, and people who like being rich will value a dollar more than those who don’t, all else equal. 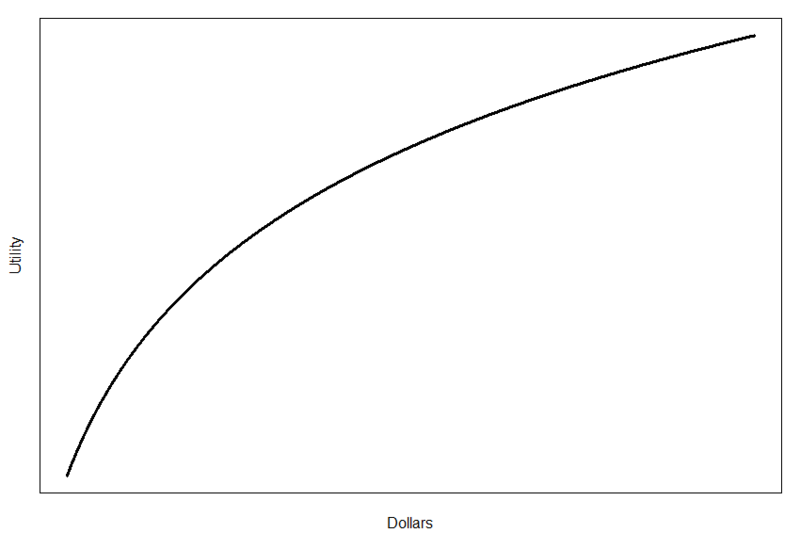 The amount a dollar can buy (averaged across all goods and services) should be a pretty good estimate of the average value of a dollar to different people with different amounts of desire to be rich. So the value of a dollar contains some noise – it varies across individuals – but this principle does not result in a bias. OK, so different people value money differently. So what? The problem here is that we use dollars to judge investments and policies. We measure things like GDP without distinguishing the fact that a dollar of GDP in Bill Gates’ pocket is not the same as a dollar of GDP in the pocket of the working poor. An economic policy that improves GDP growth but effectively transfers wealth from the poor to the rich is likely to decrease net value in society. All of this is not really news to economists, who talk about utility and utility functions, and sometimes incorporate this in models. The solution at first appears to be simple: we should simply tax the rich more and redistribute the wealth. Doing this will produce a greater total amount of value in society because we are taking money away from those to whom it is worth the least (the rich) and giving it to those for whom it is worth the most (the poor). Unfortunately, the logical extreme of this is a complete redistribution of wealth: pure communism. Some people may think this is good, but I am firmly on the side of those who think we have enough historical evidence to say that pure communism doesn’t work at the scale of nations. This discrepancy arises because we have ignored another principle: that effort (usually) requires motivation, and that money serves as an important motivator at a societal level. A complete redistribution of wealth removes this, and growth and productivity decline. Designing good policy involves incorporating many such principles simultaneously and finding a balance among them. This balance (in my opinion) should probably look something like European- or Canadian-style social democracies. So what good is recognition of this principle of the fickle value of a dollar if we can’t take it to it’s logical extreme, and if it is already incorporated intuitively in many countries? I think there are at least two important benefits. First, I think it is feasible to develop measures such as “wealth-adjusted dollars” that reflect value, and that will allow us to model the benefits of policy to society mcuh more precisely (see below). Second, explicit consideration of this principle in policy debates would help us achieve a better balance between preservation of market incentives and maximizing value rather than dollars. For example, we are now debating the “Buffett rule” in the US – a tax on the rich. In the current calculus, one dollar of tax generates one dollar of government revenue, making the tax seem like a larger value burden than it is. In a wealth-adjusted dollar context, a tax on millionaires might generate one dollar of government revenue for 10 cents of tax… This doesn’t mean we should forget about the effects of tax on economic growth, or that soaking the rich will solve all our problems, but it makes the trade-offs much clearer. Imagine the consequences of requiring such a method to be used in all Congressional Budget Office estimates! The goal is to come up with a way to represent how much each dollar is worth to people (on average) as a function of their wealth or income. 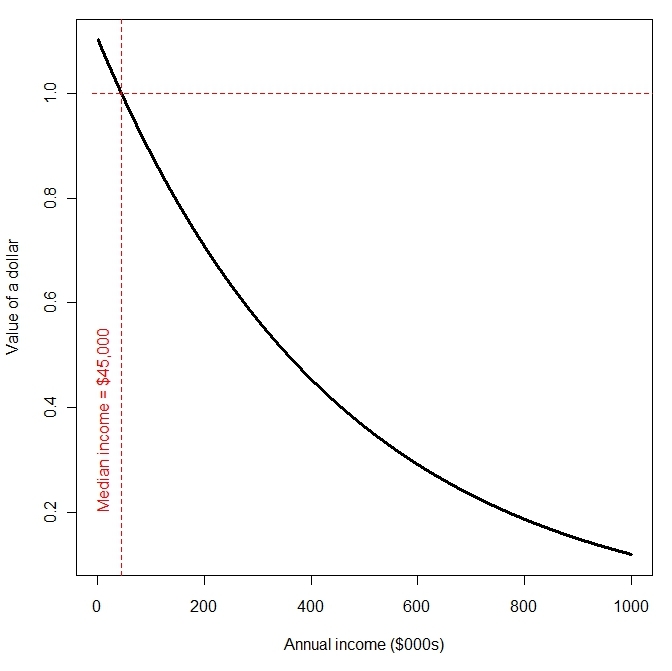 I’ll use income here, since it is a more readily available measure and is more intuitive, but will call it wealth because (a) “wealth-adjusted dollars” is easier to understand as a phrase, and (b) WADs is a cooler acronym. V is the value of a dollar, and x is annual income (i.e., we are modeling V as a function of x). We also have a few other parameters: e is the natural constant 2.718 (the base of the natural log), K is the median income, and beta is a rate constant. Beta is very important because it determines how quickly the value of a dollar declines with wealth; I estimate a value of 10 is about right, but you can play with it and see what you think. It should be possible to estimate this empirically based on people’s purchasing habits: to what lengths will consumers of different income levels go to save a dollar on their purchases? But for now, I use a value of 10. According to this curve, someone who earns $10,000 values each dollar at $1.08, someone who earns $100,000 at $0.88, someone who earns $500,000 at $0.36, and someone who earns $1 million at $0.12. Hey! Interesting that you should bring this up because I have been thinking about this a lot lately. I went rapidly from a very poor income bracket (I made $8000 in 2009) to a very comfortable middle class income bracket in 2011. Living mostly in nice social democracies (except for a few months in the US in 2009), and thanks to Visa, I was largely buffered from the problems of the poor, but the differences in the value of a dollar to me are still stark. It might be a nice thought experiment for me to play with values for beta until I come up with something that reflects my persona perception of a value of a dollar in 2009 and 2011. I’ll let you know what I come up with. Yes, actually, it’s more or less the same reason I had the thought: Suddenly I can’t be bothered to bargain shop because it’s literally not worth my time in most cases: the money saved is less than my hourly salary. I’m living the life of a rich man in a way I swore I never would in my semi-hippie youth, and I feel guilty about it but it also makes sense. My bigger goal would be to get this considered in policy debates, but I’m not sure how. Glad you liked it! An interesting question from the Euro perspective might be how using a standard currency across societies of varying wealth complicates the picture… Not sure I have the answer.